Connecting to Android Market from a browser or launching Android Market Apps with your android phone and search the program by typing keyword "eurojapan". How to change the translation language? 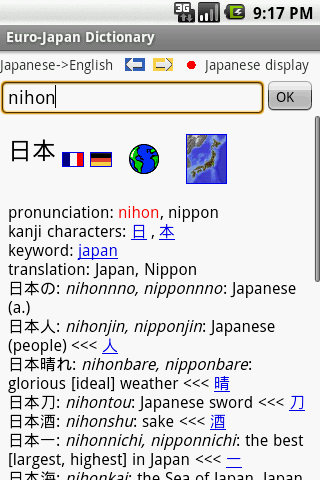 By changing the default setting of your phone or purchasing "Euro-Japan Dictionary Gold". Concretely, go to Home/Settings/Local & text/Select locale, then choose between English, French or German. If you have purchased it, those cumbersome operations are not necessary. 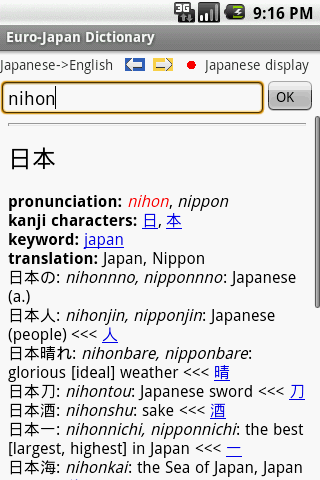 Euro-Japan dictionary for iPhone is available at Itunes Store. Seppukuman for Android is also available at Android Market. It is the first release of Euro-Japan dictionary. This version shows a cancel button on the progress bar besides some corrections of bugs. A new database for local search has been also uploaded so it is recommended to proceed a database initialization on your phone. The database files for local search are zipped so they should take less time to download with less transmission errors. They also include keywords like searches via Internet so the database on your phone should be reinitialized. Some corrections of bugs such as crashes of the program when a local search is launched without putting any characters on the search field. This version allows carrying out a partial search in the local mode, i.e. it consists of using only one of the 3 dictionaries or/and stopping at the first finding. You can also easily update the dictionary database. Those commands are available from the menu "Partial search". A new database for local search has been also uploaded, so you can proceed a database initialization by forcing it, if you have an old one. This version corrects some minor bugs discovered later. It allows also adjusting the number of words displayable per page for a local search. This version downloads directly a dictionary database from the server instead of forming it from a downloaded cvs file. Consequently the initialization should take far less time. Moreover it continuously updates the number of words found during a local search, so you could easily stop it at any time and avoid superfluous access to the database. This version should show more clearly the progress of a database download. By the way, a new version of the database for local search has been uploaded. You can use it by forcing the database initialization from the menu. This version allows changing freely the translation language among three (English, French and German) in a local search, if you have already purchased "Euro-Japan Dictionary Gold" from Android Market. Otherwise only one language should be activated. You should enjoy a great improvement in the access time of local searches with this version, but the old users need to reinitialize the database because the file format is a bit different. Moreover, the second server has been added for searches via Internet in order to avoid a long latency. This is a minor fix of the precedent version. Some katakana words in Romaji characters and numbers in Arabic numerals couldn't be found in local searches. This version allows downloading the dictionary database for local searches from the second server by switching in the menu, when the first is busy. An addition of the menu in Japanese and correction of some bugs. A new version of the database for local search has been uploaded. so you can download it by forcing the database initialization from the menu. This version can display pictures associated to the word you search in internet mode, if they are available. This version allows displaying Google Map of the place names you search in internet mode, if it is available. This version fixes some minor errors. The words with some Spanish characters were unreachable even if they are in the database. It was impossible to change 2 times the server’s name. “e, es” terminating German plural words were unreachable from singulars and vice versa. The new version modifies the following features. 1)	The default server is docoja.com which should be more responsive. 2)	The clear cut between paid and free versions. 3)	The program displays AdMob banners, if available. The new version allows more Japanese spell variations by mixing Kanji and Hiragana. It also links to a different Google Map, when several locality names come from the same word, such as Washington DC and Washington State. This version has got the following improvements. 1)	It displays the server’s name during a search or database download so you could know which one is stuck 2)	Again, more Japanese spell variation has been added. 3)	The paid version does see no more ads. This is an urgent update to mend the following bug. Some telephone models such as Galaxy S crashed with precedent versions, when you perform several times internet searches while local searches work fine. This version fixes some minor errors such as: some German words couldn’t be found even if they are in the database. More spell variation of Katakana words has been also added. This version fixes some minor errors such as: some Kanji characters couldn't be found with Romaji in local mode, even if they are in the database. The minimum supported Android version is now 1.6. This version fixes some minor errors such as: the menu language couldn't always change according to the display mode or the dictionary. We have also added an option menu so you could save your preferred search mode (local or internet) or language (English, French or German for paid users). This version allows purchasing “Euro-Japan Dictionary Gold” from Android Market without leaving the program, so you could easily transform the free version to a multilingual dictionary without ads. This version fixes some minor bugs such as he->e and ha->wa conversions in local search in Romaji. More spell variation of Kanji expressions has been also added. This version fixes a minor bug, i.e. some found words remained black instead of becoming red in search result. This is a major update and adds several improvements in local search mode such as: 1)	Faster word searches even if you type kanji characters. 2)	More accurate ranking of found words. 3)	Display the same number of words as Internet mode. 4)	Paste words from other apps. By the way, you should download a new dictionary, if you upgrade from previous versions. This is a minor update and allows displaying always a search box at screen top with internet search mode like local search. It fixes also some minor bugs. This minor update brings some improvements on the layout such as a larger search box. It corrects also some Kana->Romaji conversion errors. It is workable with Android 1.5 but the machine which uses it may be too slow in local search. This update corrects some minor bugs such as the virtual keyboard remaining on screen after the first search. You can also launch a word search by touching “return” key instead of “OK” button. This update corrects some minor bugs such as wrong Kana to Romaji conversions. It excludes also words between parentheses during searches. You may also need to download a new database by resetting it from menu/partial search, if it is about an upgrade, for it contains hundreds of words more with many corrections. From this update, you can no more type Japanese characters when English to Japanese translation is chosen. The program also improves the ranking algorithm when a search has found several words, especially in English to Japanese translation. You may also need to download a new database to enjoy the new ranking algorithm, by resetting it from menu/partial search, if it is about an upgrade. This update allows resetting the database by a checkbox on the start screen without passing the menu. By the way, if this is your first launch, you should see the box already checked, because you must always download a database. Meanwhile you may try to download a new version of the database by checking the box, if it is about an upgrade. The last version allows adding more information on the words found during an offline search, such as synonyms, antonyms and Kanji characters used. This is an option activatable from the "Partial search" menu but recommendable only for the last generation of phones with a fast processor and enough memory. This is an urgent update because the precedent version didn't display correctly banner ads and also the translation direction in some cases. The last version allows adding cross-references between the words found during an offline search. This is an option activatable from the "Partial search" menu but recommendable only for the last generation of phones with a fast processor and enough memory. You may also need to download a new version of the database by initializing it, if it is about an upgrade. The last version allows retrieving previous search results by “back button” (limited by memory size in online searches, and 10 results for paid users and 1 for free users in offline searches). By the way, you can always come back directly to the initial page from one of the menu commands. You may also need to download a new version of the database by initializing it, if it is about an upgrade. The last version allows retrieving previous search results by back and forth buttons (limited by memory size in online searches, and 10 results for paid users and 1 for free users in offline searches). They turn to yellow from blue when no results are available and force to return back to the initial screen if you continue to tap. The last version also updates correctly the search box and translation direction when you go and back in the saved results.